As with other tutorial in this series this will not go into all details and changes that were made in the code, instead it will deal with a few main subjects that will hopefully provide ideas and sample code to others interested in python and PyGtk programming. Now a while back I had an interesting idea that I would like to create a simple theme engine for the PyLan application. I thought that it would be easy and let me (or other people) change the icons or colours that are used. I thought that this would be a simple enough idea that I could implement quickly and then expand in the future to have more features like the ability to save and load the theme from xml. from the theme_dict into the internal theme dictionary. out the internal dictionary before we load the items? So what is happening here? Not that much, the Theme object uses the dict object as a base class and then lets you initialize the Theme using a dictionary, which is done using a helper function. This was put for future usage and is not used yet. The next item in the Theme setup is the ThemeItem object. This is the object that will be used as the value for each item in our Theme dictionary. @param type – number – The type of theme item. is a pixmap it should load the image file. it should create the data. First you can see that there are two date members in the ThemeItem base class, the _m_type and _m_data. The _m_type is simply used to let interested parties know what the type of theme object is. I’m not sure if the _m_type is still needed, originally I was using it but after changing a few things it doesn’t really do much (anything?) anymore. The next data member is that _m_data item that is meant to be private and accessed through the data property. As you can see the data property cannot be set it can only be read. This was done this way so that only the ThemeItem would be able to set its data. Now the data member can be anything, it could be an image, a colour, whatever you want it to be. The data member will generally be set by a subclass of the ThemeItem. You’ll also notice that the data is “loaded” in the __init__ function. By default the load_data() function does nothing, and should be overridden in the base class. “””Initialize the pixmap theme item. Pretty straightforward here, a simple subclass of the ThemeItem object that overrides the load_data() function and adds a new class member. The load_data function simply loads a pixmap into the data using the gtk.gdk.pixbuf_new_from_file function. So this is how I use the theme in the main PyLan application, I’m using it to determine what icon to display for tasks and what icon to use for categories. As you can see I simply create a theme member in the PyLan class and the add two ThemePixmap items to the Theme, each index by constants that will be used to identify them later. In the future I hope to use this function to load the information from a file. I will show you how the theme is used in the next section. So now that we have a simple theme engine that load graphics for us we need to figure out how to show images in our gtk.TreeView. What we will do is we will use the gtk.CellRendererPixbuf to render our image. We will also pack the image into the same column as the Title column. We do this so that the icon isn’t in a column of it’s own, which would seem quite strange. Basically what we will do is create the gtk.TreeViewColumn in our normal way, using the gtk.CellRenberPixbuf, then when we use the gtk.TreeViewColumn.pack_start function to add the gtk.CellRendererText (representing the Title Text) to add the text to column. This means that we will have two cell renderers in the same column. 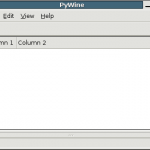 The actual code to accomplish this in the pyLan program is quite complicated as I attempted to use the todoColumn object as a generic way to order the columns. This worked fine before but now it has become a more complicated and slightly hackish now that we want to be able to pack items into the same column. Sufficed to say I accomplished this by adding a new share_column member to the totoColum that allows you to Pack Widgets. Where app_theme is an instance of our Theme object described in the previous section. Pretty simple, all we do is we get that Theme item in the applications theme and then return its data. If this seems strange or you cannot understand it, please take a look at the previous tutorial and you you will be able to understand what the get_column_list() function does. One of the things that has been bothering me about the PyLan application was that all of the buttons on the toolbar were always enabled even when they cannot perform their function. Now I’m used to the Enable/Disabled terminology except in GTK the terms sensitive and insensitive are used, so I will try to use them from now on, but if an enabled or a disabled slips in there please forgive me. The code is pretty simple, we grab the widgets from the widget tree, and then we simply call the set_sensitive function and tell them to be insensitive by passing False to the function. Pretty simple, we get the gtk.TreeSelection from the gtk.TreeView and then we connect the on_tree_selection_changed() function with the changed signal. object associated with the gtk.TreeView. First we get the selection_iter from the gtk.TreeSelection and then we enable the edit, delete, and add_task buttons based on whether or not there is a selection in the gtk.TreeView. If nothing is selected then we make the buttons insensitive. One feature that I wanted to implement in the application was the ability to remove selection from the tree by clicking on an empty space in the tree. As far as I can tell there is no simple method to enable a feature like this in PyGTK, which I found quite surprising. As a result what I needed to do was connect to the gtk.TreeView’s button-press-event. Then we use the location where the user clicked and see if they clicked on an item in the tree. If they did not click on an item in the tree then we remove the selection from the tree. If they did click on something then we leave the selection as is. As you can see, we take position of the cursor where the button was pressed and then call the get_path_at_pos() function in the gtk.TreeView which returns a tuple containing information if an item in the tree can be found at the specified x,y position, and None if nothing in the tree was hit. Now one of the problems that I had writing this tutorial is that it’s getting very hard to detail all of the changes that are made to the project. So I have tried to leave out as much extraneous detail as I possibly could, but then I start to wonder how much use anyone could get out of these articles if the details are left out. Hopefully there is still enough in there so that people can get ideas and at least some hints as to how things work in some of the slightly more advanced areas of PyGTK. I’m not sure if I am going to continue detailing everything in this test application, I might skip a few phases since detailing everything is getting to be more of a problem. But what I really want to focus on soon is working with things like Preferences and distributions. Sadly time is always a factor! If you have any questions please ask away as always! Thanks JesÄ‚ÅŸs, yeah I’ve been away from the tutorials for a bit now, but I’d like to work some more free time into my life so that I can work on this stuff more. That’s a useful and informational tut. Thanks for saying that, hopefully there is enough information and code there so that it will answer some peoples questions! Thanks for all tutorials! They helped me start with pygtk. quick one showing how to do it? I’m really puzzled and can’t figure it out. but right click menu… no dice. 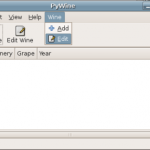 Pingback: learning python » Blog Archive » PyLan a GTD todo application written in python and PyGTK - part four context menus! Thanks for the nice and simple examlpe. You’re just missing one crucial piece of information:comparator should specify a custom comparison function of two arguments (list items) which should return a negative, zero or positive number depending on whether the first argument is considered smaller than, equal to, or larger than the second argument.See note 8 under of the official python documentation. How does a person become a chirstian?.Â Do we become a christian by repenting of our rebellion against God and then say the sinners prayerÂ by our own free-will, or are we born again first and then acept Christ?.Â What does it mean to be “born again”? Is making a decision for christ at an alter call and being born again the samething. Thanks for the biblical based teaching.